Wonder Woman (from DC Comics) is one of the oldest female super heroes and the first comic of her was released in 1941 already, there was a tv series in the seventies and she was a character in the cartoon series like the “Super Friends” and of course the Justice League. 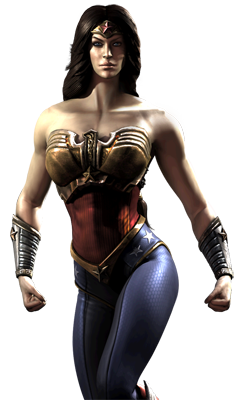 Her most notable role in a video game seems to be her appearance in Injustice: Gods Among Us by Netherrealm Studios released in 2013, but before she was in multiple other games ranging from her game debut in 1995 in Justice League Task Force on the Sega Mega Drive and later the Super Nintendo to DC Universe Online and even the Batman Arkham City game via cameos. Wonder Woman is a quite cool character and i really hope to see a whole video game dedicated to her alone as the main protagonist someday in the future. Due to her raising popularity through Injustice, i guess i can feature a few nice game related fanart and cosplay artworks here soon.